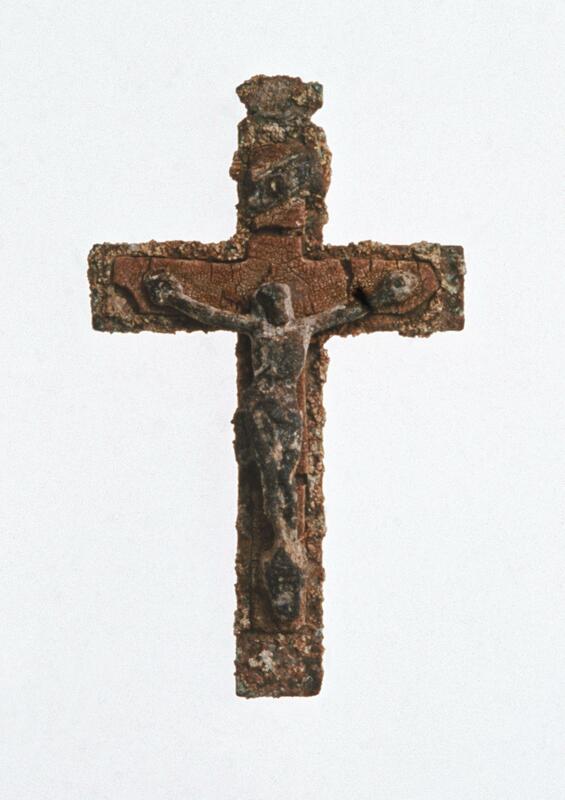 This metal crucifix, although now quite corroded, was carried across the Atlantic to the Americas in the late 15th century by one of the first permanent European settlers in the Caribbean. A small item (4.5 cm in height), it was intended for personal devotion. This cross is the only explicitly Christian object to have been excavated from La Isabela, although it would have been one of many private and public images used for worship in the town. The others may have been crafted of perishable materials. The form of the cross, with its short horizontal arms, is known as the Latin cross. It was the most common shape of the cross introduced into the Americas. On it is Christ’s body, today visible only in its basic outlines, with a twisted torso with hips and head tipped to the left. The names of the craftsman and the person who brought this crucifix to La Isabela are unknown. Based on what is known about the town and the history of metalwork in late-15th century Europe, both the maker and owner of the object were most likely men, although not necessarily Spaniards by birth. 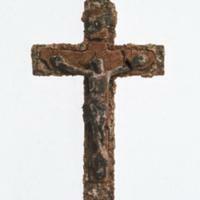 Archaeologists believe this crucifix was made of copper alloy and other metals. Excavated at La Isabela, this crucifix is one of the earliest known religious objects from the Americas. La Isabela, although a short-lived colonial endeavor (ca. 1493-1500), was intended to be a permanent Spanish settlement, set among Taíno peoples. Other personal items excavated there include finger rings, belt buckles and metal fasteners for cloaks. Today the crucifix forms part of the historical archaeological collection at the Florida Museum of Natural History. La Isabela was established by Christopher Columbus in 1493. Set among Taíno peoples, La Isabela was settled by Spanish farmers, friars, craftsmen, and soldiers (all men), who eventually proved exploitive of native Taíno. These Spaniards crossed the Atlantic with necessary supplies: livestock, seeds and plants, ceramics and metal guns, and visual works like this one to sustain prayer and devotion. Of those who settled in La Isabela, all would have been Christians and understood well the meaning of this crucifix. La Isabela: First European Town in America. Chiarelli, B., ed. 1987. “La Isabela.” International Journal of Anthropology 2 (3): 195-253. Deagan, Kathleen and José M. Cruxent. 2002. Columbus’s outpost among the Taínos: Spain and America at La Isabela, 1493-1498. New Haven and London: Yale University Press. La Isabela: First European Town in America. Historical Archaeology at the Florida Museum of Natural History.